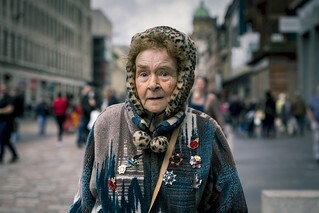 Candid eye contact street photography from Glasgow, Scotland. Although it was her make-up that caught my eye, and bless her for making an effort, she actually smiled and thanked me after I captured this image. She was 'made up' at being photographed and although the negative encounters stand out, by far and large I get positive responses like this when shooting street. Without boosting the orange I used split tone processing to introduce some teal into the shadows for a slightly cinematic feel to the shot. Wishing all of my Flickr friends a wonderful weekend ahead.